While Myeongdong is known to visitors as a haven for shopping and street food eating, for locals Myeongdong isn't exactly known for its dining. Yes, the choices are diverse and seemingly endless, but it's mostly chain restaurants serving average to decent but unmemorable food. One of the reasons behind this is the fact that the commercialization of the area over the past few decades have led to many regular stores being muscled out by commercial chains. A few of the oldie but goodie spots remain however, and have maintained their popularity and standings including Wonjo Hanchi, the place I'm introducing today. Hanchi (한치) is the name for cuttlefish which I'm told are smaller than their cousins, the squid. You'll see quite a number of restaurants in Seoul that serves or specializes in squid but it's less likely you'll come across places that serve hanchi. But, as its name shows, Wonjo Hanchi not only specializes in cuttlefish but it has been doing so for some 20 plus years in the same spot. The restaurant's humble entrance interior clearly reflects that this is a place that's been around for quite some time. Unlike the broad, crowded main streets of Myeongdong with blinding neon signs and K-Pop music blasting everywhere, Wonjo Hanchi is located in a small alley within the area which, if you weren't looking for the restaurant, you probably would pass the alley entrance without knowing. Yes, that's a line for this unassuming restaurant. Rather surprising to see but it definitely showed Wonjo Hanchi was a famous one. While waiting in line, I noticed that the restaurants next to it were virtually empty in comparison. The restaurant is of average size inside but it has a second floor. The floor above however, is traditional Korean-style floor seating while the first floor is seated tables. It's quite a mad scene inside as patrons wait for seats, servers rush around, and orders fly about. It seems here it's a seat-yourself place here as people went by the honor system of first-come-first-serve for seats. And apparently very few wanted floor seating as, later when I had to use the restroom upstairs, I saw that the second floor had plenty of tables available unlike the first floor. The star menu items, as the restaurant's name suggests, are its hanchi dishes which you can get parboiled (hanchi sook hweh or 한치숙회), raw sashimi style (hanchi hweh or 한치회), battered and fried (hanchi twigim or 한치튀김), and seasoned and cooked on a pan (hanchi bulgogi or 한치불고기). All the hanchi dishes are 15,000 per order except for the hanchi bulgogi which is 12,000 per order. Rice is separate in the orders. They also carry daegutang (codfish soup or 생대구탕) which is a popular spicy fish soup with usually the older generations. The daegutang is 13,000 won per serving. If you order the hanchi bulgogi, you can get an order of daegutang for only 10,000 won. Soju, Korean bottled beer, and makgeolli are also available. If you're having trouble deciding and/or have a large group with you, you can opt for the restaurant's popular set menu. The set menu comes with six courses of food: hanchi bulgogi, samgyeobsal (which comes with the hanchi bulgogi), hanchi sook hweh (parboiled), hanchi hweh (raw), hanchi twigim (fried), and daegutang. Sets can be ordered in two, three, and four person which go for 42,000; 63,000; and 84,000 respectively. My friend and I weren't crazy hungry so we went with a two person order of the hanchi bulgogi and waited for our food. The kitchen and serving station is open and clearly seen on the first floor and there were about 6 or 7 people scurrying about to prep and serve the food. Side dishes for my visit included soybean sprouts, mini anchovy stir fry, kimchi, and pickled radish slices. Overall they tasted fine albeit a bit on the saltier side. I noticed that in posts from other bloggers who had been, the side dishes seem to change and switch up. As a tip, reserve a bit of the side dishes to add to the fried rice at the end for some oomph! The hanchi bulgogi also comes with steamed eggs (gyeran jjim) which comes bubbling to your table in a ddookbaegi. The hanchi bulgogi mixture arrives on its pan and ready to be cooked right away. I noted that the kitchen mixed everything together just before serving which is good as it keeps the vegetables from turning limp and soggy. The mixture has sliced hanchi, perilla leaves, cabbage, and onion. They definitely don't skimp out on the hanchi which was plentiful. If you order the set, the mixture also comes with some samgyeobsal slices on the bottom of the pan for some added protein. As the dish comes uncooked, it took a good 8-10 minutes for things to get fully cooked as the seasoning cooked into the ingredients and hanchi plumped up considerably. Ooh lala, aren't you looking fine? You can pick off from the pan and eat directly (careful, it's hot!) or you can use the pickled radish slices to make a little wrap for yourself. The pickled radish slices are both sweet and tart and comes pickled with a bit of wasabi for a nice quick. It worked quite well with the hanchi bulgogi mixture. You would think because of the hanchi bulgogi's color that the dish is quite spicy but it was surprisingly subdued. I learned later on that Wonjo Hanchi adds peanuts as an ingredient to its seasoning sauce which tamps down on the spiciness while increasing the depth and complexity of the flavor. I didn't know this while eating and I didn't catch any peanut scents but I did notice it had a slight smooth and cream-like edge to it. Many Korean restaurants serving spicy octopus, squid, baby octopus and such seem to all be amplifying their spice levels but Wonjo Hanchi's avoids that and puts its spice level at a public-friendly and gentle level which should make it more friendlier for more folks. The steamed eggs, of course, helps also quell down any fires in your mouth. The vegetables inside the hanchi bulgogi were very fresh and the hanchi were plump with the perfect consistency and bite. No rubbery and chewy cuts here! After scarfing through most of the dish, I eagerly put in an order for fried rice. Though we ordered just one bowl of rice for frying, the owner lady told us we looked hungry (hope that's a compliment) so she went a little heavy handed and put in a bowl and a half of rice. The rice mixture is incorporated into the leftover flavorful sauce and cooked on high heat to develop a nice crust underneath and given a nice sprinkling of roasted seaweed bits on top. If you want to add some more texture and flavors to the rice, try adding your leftover side dishes to the mixture at this point! Flavor-packed and oh-so-good. No remorse or guilt here, thank you very much. As I said before, unless you're living by the coast somewhere, it's not common to come across a hanchi restaurant and Wonjo Hanchi is a fine establishment to try it out in Seoul. Its popularity and many years attests to it getting it right. It's also one of the better, original Korean restaurants you'll find in touristy Myeongdong. Wonjo Hanchi gets it right with the basics including fresh ingredients and good food. Prices are just a bit above average and the side dishes could cut down on the sodium levels but the restaurant knows its stuff for sure which is why it's one of the best spots you can try cuttlefish in Seoul. Come out exit 6 and enter the alley on your left down for about 80 meters until you get to a major street with the KEB bank building in front of you. Turn right and walk about 50 meters and you'll get to a Paris Baguette and 7-11 Convenience store as the road diverges into two. Follow the path to the right of Paris Baguette and walk down about 40 meters until you see a KFC on your left. Immediately to the right of KFC there should be a small alley. Walk down that alley for about 25 meters and you'll see Wonjo Hanchi on your left. 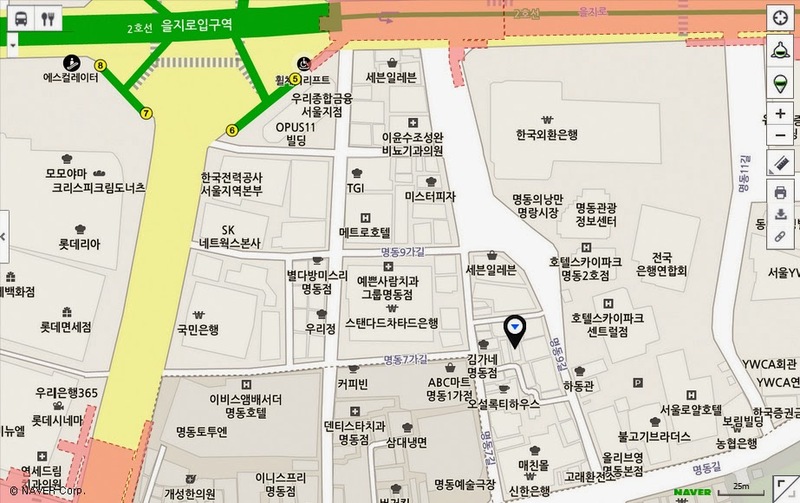 For those who may miss it, the alley entrance to Wonjo Hanchi looks something like the screen capture below. I'm not sure if that cosmetic store in the picture is still there as the map view is from 2012 but the KFC is definitely still there. Alternatively, if you're in the middle of Myeongdong, get to the major 4 way intersection where the Myeongdong Theater, Daiso and Woori Bank is. 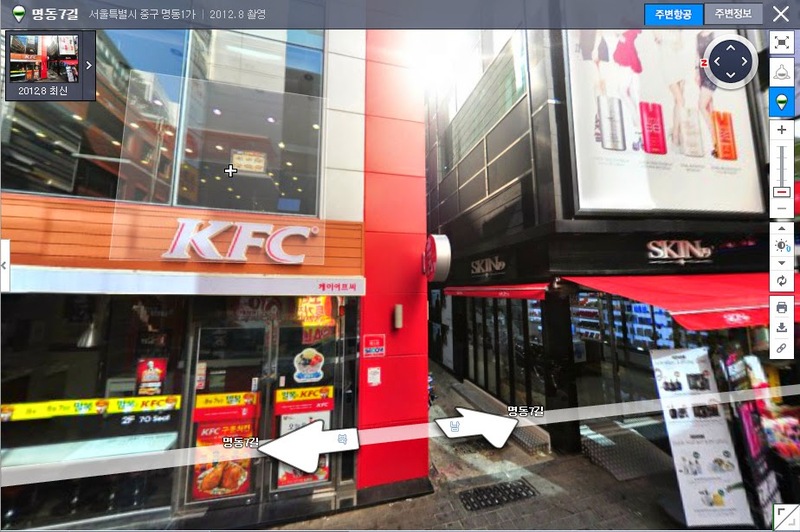 Follow north from that 4 way intersection, between Myeongdong Theater and Daiso, and after about 50 meters you should see the KFC on your right as well as the alley entrance next to it. If you have a large group and appetite, the set menus are a great way to try a lot of food. Also, if you order just the regular hanchi bulgogi, you can get the daegutang for 10,000 (as opposed to its regular 13,000 price). I'm not sure of the basics but this online coupon seems to allow a 10% discount on your entire purchase. I think you may have to download that Yap app and there seems to be rules about the coupon unavailable on Wednesdays and Thursdays but it's a nice discount if it works! This was a very nice surprise.....the outside of the restaurant did not give an outward look that it might be good.....BUT when we tried it, this Hanchi bulgogi is the best....eaten with pickled radish....two thumbs up. The hanchi hweh we also tried which was also very good......fresh and I think I noticed a hint of " sprite" ....he he he.....dont know why.....we love this place for its hanchi bulgogi....despite its cramped space....food are seriously good!! !